In recent years offshore wind has become one of the fastest growing forms of renewable energy technology worldwide. Nevertheless, there are still several markets with large potential for deployment. 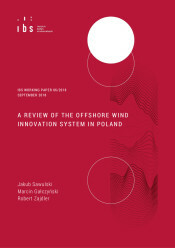 In this paper we assess the offshore wind innovation system in Poland. We apply the Technological Innovation System approach. This procedure has been widely used to describe the offshore wind innovation system in Europe. However, the existing literature concerned European countries located at the technological frontier, while in this publication we examine this issue in a follower country, which is still waiting to deploy its first offshore wind installation. The upcoming transition of the Polish energy system, resulting from depletion of current coal resources and EU climate policy goals, makes Poland one of the most promising markets for renewable technologies, and the geographical location puts Poland in position of the main actor in kick-starting the offshore wind market on the Baltic Sea. However, in our study we identify a number of challenges for offshore wind technology deployment in Poland. Some of these challenges include the unpredictable public policies, limited grid infrastructure, rather poor quality of research provided by scientific organisations and weak interactions between science and business. To address these issues, we propose a set of policy instruments, which, we believe, will significantly contribute to the development of offshore wind technology in Poland. additional information: We would like to thank Jakub Sokołowski and Jan Witajewski-Baltvilks for their comments. The publication contains complete results, which first part have already been published as IBS Working Paper 06/2017 (first two chapters). The research leading to these results received funding from the European Union Horizon2020 under Grant Agreement No. 642260. Usual disclaimers apply. All errors are our own.